5-minute walk to Falls Park, the baseball stadium, Main Street, and the Swamp Rabbit Trail. 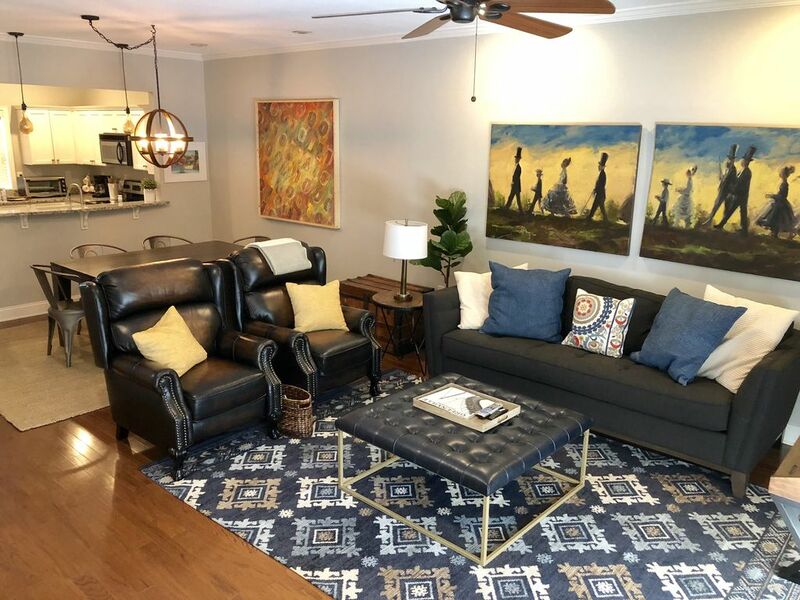 With room for 6 adults, this townhouse is conveniently located in the West End of downtown Greenville and is perfect to visit friends, a week of work or your next getaway. Young kids and pets ok! Parking Included. This 2-story, 2 bedroom townhome has everything you need to enjoy your stay in a prime location! The first floor offers a modern kitchen w/ granite countertops and stainless steel appliances. The open living plan connects the kitchen with the dining room, with seating for 6. The well-appointed living room w/ wood burning fireplace and 55" smart TV provides room for everyone to hang out together. Grill dinner and enjoy the Greenville evenings on the back patio. The second floor is carpeted with 2 bedrooms, 2 full bathrooms, and a laundry room. 2 free parking spots included right outside the front door. Guests will have free access to WiFi, coffee and tea, 3 TVs w/ Spectrum Cable, a gas BBQ grill, washer/dryer, clean fridge, and plenty of firewood for the fireplace. Also 2 free parking spots outside the front door, the entire 2-story townhome, the back patio area with seating for 4, and a grassy area at the end of the parking lot for your leashed pup. We live in Greenville and are happy to answer questions, provide suggestions or solve problems at any time. This property is family friendly, so a pack-and-play and booster seat will be included. We love dogs! There's a grassy area on-site to take your dog out on a leash or enjoy a walk on the Swamp Rabbit Trail which connects to the end of our street. Hi! My husband and I are so happy to welcome you to our townhouse! We've been in Greenville for 12 years and love it. Downtown is changing weekly, it seems, so we're exploring right alongside you, trying the new restaurants and shops, enjoying the festivals and playing in the parks. We also love to travel and meet new people. So far we've taken our 5 kids to 7 countries and we can't wait to visit more! We love the location of this townhouse! The amenities, including two free parking spots, can't be beat - two bedrooms with ensuite bathrooms, a laundry room, fireplace, patio with seating and a grill, a chef's kitchen with stainless steel appliances - it all adds up to an incredible home in downtown Greenville. Plenty of wood provided, plus fire starter. Leather recliners, comfy couch, 55" smart TV with Spectrum cable, wood-burning fireplace, desk and pullout sofa bed. Coffee, tea, sugars and creamer provided. Full-size toaster oven holds a muffin tray, cookie sheet, frozen pizza, etc. Oil, salt, pepper, cinnamon, garlic powder and chili powder provided. Solid wood table seats 6, including a bench and 4 chairs. A booster seat is available for toddlers. 3 TVs - one in each bedroom and a Smart TV in the living room. Spectrum Cable provided on all 3 TVs. Board games, cards and puzzles provided. Seating for 4 on the back patio. Perfect location in a vibrant downtown! The owners thoughtfully supplied amenities, it was clean and in an excellent location to enjoy all that downtown has to offer. This is a great place. Very well maintained and clean. It is located in a great area near all the downtown attractions. Will definitely come back and stay here! We had a wonderful weekend at Greenville's West End Townhouse. The townhouse is impeccable. It is clean, well-appointed, and very convenient to Downtown Greenville, especially Falls Park. We visited with our best friends and the townhouse proved to be perfect for 2 couples. In addition, Melinda and Peter went the extra mile with personal touches from restaurant recommendations to providing a selection of coffee and teas. We will come back! The townhome was wonderful. Easy walking distance to downtown, my wife and I really had fun. The unit was clean, comfortable and functional. Our daughter stayed with us for three days, and a friend of mine stayed for a night. We greatly enjoyed the many walking trails and views of the river, and spent lots of daytime hours walking and seeing the sights. My wife and I truly enjoyed our visit to Greenville and would recommend this property to anyone planning to do the same. What a welcoming home. My family and I enjoyed our short stay and truely felt we had a home away from home. I would definately recommend and would return to stay if our travels bring us south again! This townhome is located 5 min walking/1 min driving to main street downtown and Falls Park. Very comfortable 2BR/2.5 bath that is fully stocked with supplies, including many accommodations for kids. We felt very well hosted and would recommend to friends and return ourselves! Short walk to the waterfalls at Liberty Bridge in Falls Park, the centerpiece of downtown Greenville. Shorter walk to Fluor Field, home of the Greenville Drive baseball team. The Governor's School is just down the street, a 1-minute walk. And the Swamp Rabbit Trail connects to the end of our street. We're located in the West End of downtown Greenville, which is bustling with restaurants and shopping.